Researchers of Tokyo University, MIT and Microsoft have realized the dream of electronics engineer ! They published today , at UbiComp conference, a new paper showing the possibility of printing electrical circuits using a home inkjet printer with special ink developed by Mitshubishi. Many applications such as RFID, sensors, PCB, etc. can be applied from this technology. The Document Recognition and Retrieval conference takes place every year in San Francisco at the beginning of February. During this conference, I presented a paper about documents analysis (semi-structured document image matching and recognition). I also had the honor of receiving the award for best student paper. From 21 to 23 March 2012, the Symposium on Writing and Document (CIFED) held in Bordeaux. Since 1992, every 2 years, CIFED is gathering the French scientific community to expose and exchange ideas around the themes of the written document. 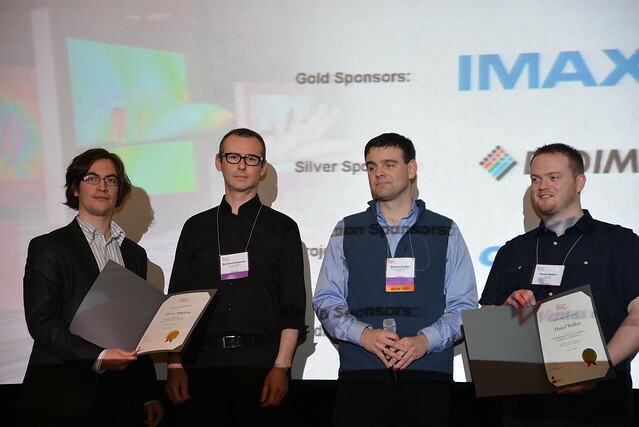 International researchers presented their works about document image analysis and processing. I had the opportunity to participate to this conference, but also to present a part of my thesis work. At the end of this conference, I had the honor of receiving the Best Paper Award for my work about the recognition of semi-structured documents. My oral presentation (in French) is available here.